Newly built three story Mediterranean style villa with unobstructed views overlooking the ocean and multiple lush Coco palms. Third story roof deck allows for panoramic view, sunset wine sipping and tranquil dining. Interior decor presents authentic rustic Mexican flare of fine furniture, tiling and adobe entry ways. Decorative ceiling, wall and floor pieces indigenous from all over Mexico lend to the feel of a true Mexico experience. Private garden throughout the property with secured entry and driveway allow comfort for freedom of children and family. For more information and the property blog, - type 'vistaceleste' into a google search. Vista Celeste is just 25 miles north of Puerto Vallarta on the beautiful, secluded Nayarit coast. This beautiful close to ocean property consists of a three story house with 3 bedrooms and 2 1/2 baths, heated pool and outdoor BBQ area. This extraordinary property is situated 1/2 block from the unspoiled white sand beaches of San Francisco (San Pancho), Nayarit. Lush vegetation and palm trees surround the beautifully-landscaped grounds. Here you can enjoy spectacular views of the Pacific Ocean, breathtaking sunsets, migrating whales, playful dolphins, and sea turtles. There are a host of adventurous activities, including epic surf, pristine golf, and horseback riding at your disposal. This is the perfect destination for those who seek privacy, serenity, and/or adventure. The charming grounds are private with key entry only and a serpentine wall securing it. The villa is fully-equipped with all the amenities you will need to enjoy your Mexican getaway. Imagine yourself lying poolside listening to the waves crash on the shore or soaking in the jetted tub. Vista Celeste offers all that you need to relax, unwind, and enjoy a true hidden paradise. 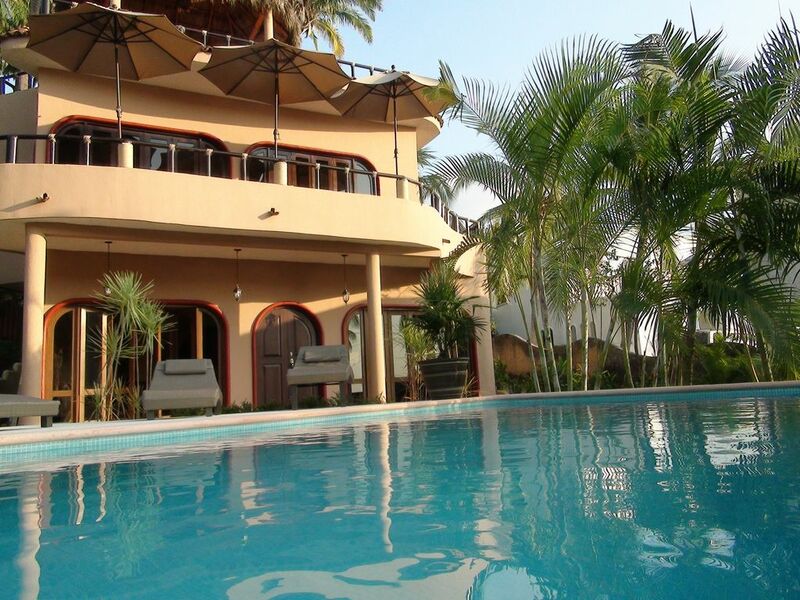 The property is located right across from Costa Azul resort and next to Villas Paradise. The property is within walking distance of town, but is far enough away to steer clear of the daily crowds and noise. When in the small town of San Pancho, you can find many shops, grocers, and many restaurants to suit the taste of any family member. Do not miss the opportunity to mingle with the locals. They are very friendly and eager to practice their English with you. San Pancho itself is a picturesque Mexican fishing town with virtually no crime. It looks much as Puerto Vallarta did before it was discovered. Vista Celeste is professionally managed for guest's convenience. For more information and availability please contact Nils and Denice Kristoffersen via email. Denice and Nils Kristoffersen have been in the hospitality business over ten years and are the owners of the award winning Wild Basin Lodge and Event Center in Colorado. Their love of nature and scenery find them surrounded by majestic peaks in Colorado, and embraced by warm waters in Mexico. They sincerely hope you enjoy the beauty of the area as much as they do. White beaches, warm waters and cobblestone streets all factored into the desire to be a part of San Pancho. Add in temperate weather, fantastic local cuisine and a friendly atmosphere, and the Kristoffersens couldn't be happier to own Vista Celeste. San Pancho's quiet beach is across the street. Town is only a 15 minute walk on the beach, or a 2 minute drive by car. House is one house away from the sand (1/2 block). Is higher than the house in front for unobstructed views. Bath and Beach towels, hand towels, bedding, blankets and pillows. Grill and cooking surface on gas range. Glasses, flatware, cups, plates and saucers for 6. Fridge, microwave, oven, gas range, coffee maker, blender and utensils. Heated pool with two sitting stools and bench. Just 25 miles North of Puerto Vallarta, Vista Celeste lies in the small town of San Francisco (affectionately called San Pancho by the locals). Secluded in the lush Nayarit Riviera, San Francisco’s small town charm, cobblestone streets and friendly locals comprise a unique getaway from the hectic hustle and bustle of modern life. Across the street from the beach, and adjacent to a resort with restaurants and countless activities, Vista Celeste offers something for everyone. Whether it’s snorkeling the pristine waters or an evening spent sampling the exquisite local cuisine, a vacation in San Pancho can be truly memorable.